Elizabeth Bishop, born February 8, 1911 in Worcester, Massachusetts - died October 6, 1979 was an American author of prose and poet. During her lifetime, poet Elizabeth Bishop was a respected yet somewhat obscure figure in the world of American literature. Since her death in 1979, however, her reputation has grown to the point that many critics, like Larry Rohter in the New York Times, have referred to her as "one of the most important American poets" of the twentieth century. Bishop was a perfectionist who did not write prolifically, preferring instead to spend long periods of time polishing her work. She published only 101 poems during her lifetime. Her verse is marked by precise descriptions of the physical world and an air of poetic serenity, but her underlying themes include the struggle to find a sense of belonging, and the human experiences of grief and longing. Bishop, an only child, experienced upheaval at a tender age. Her father died before she was a year old. Her mother suffered through serious bouts of mental instability and was permanently committed to an institution when Elizabeth was only five years old. The poet never saw her mother again. She was taken at first by her maternal grandparents, who lived in Nova Scotia, Canada. After some years, however, her paternal grandparents took charge of her. They were well-to-do inhabitants of Massachusetts, and expressed their concern over the limited financial and educational resources available in Nova Scotia. Under their guardianship, Bishop was sent to the elite Walnut Hills School for Girls and to Vassar College. Her years at Vassar were tremendously important to Bishop. There she met Marianne Moore, a fellow poet who also became a lifelong friend. Working with a group of students that included Mary McCarthy, Eleanor Clark, and Margaret Miller, she founded the short-lived but influential literary journal Con Spirito, which was conceived as an alternative to the well-established Vassar Review. After graduating, Bishop lived in New York and traveled extensively in France, Spain, Ireland, Italy, and North Africa. Her poetry is filled with descriptions of her journeys and the sights she saw. In 1938, she moved to Key West, where she wrote many of the poems that eventually were collected in her Pulitzer Prize-winning North and South. In 1944 she left Key West, and for fourteen years she lived in Brazil, where she and her lover, the architect Lota de Macedo Soares, became a curiosity in the town of Pétropolis. After Soares took her own life in 1967, Bishop spent less time in Brazil than in New York, San Francisco, and Massachusetts, where she took a teaching position at Harvard in 1970. That same year, she recieved a National Book Award in Poetry for The Complete Poems. Her reputation increased greatly in the years just prior to her death, particularly after the 1976 publication of Geography III and her winning of the Neustadt International Prize for Literature. Bishop worked as a painter as well as a poet, and her verse, like visual art, is known for its ability to capture significant scenes. Though she was independently wealthy and thus enjoyed a life of some privilege, much of her poetry celebrates working-class settings: busy factories, farms, and fishing villages. Analyzing her small but significant body of work for Bold Type, Ernie Hilbert wrote: "Bishop's poetics is one distinguished by tranquil observation, craft-like accuracy, care for the small things of the world, a miniaturist's discretion and attention. Unlike the pert and wooly poetry that came to dominate American literature by the second half of her life, her poems are balanced like Alexander Calder mobiles, turning so subtly as to seem almost still at first, every element, every weight of meaning and song, poised flawlessly against the next." Born February 8, 1911, in Worcester, MA; died of a cerebral aneurysm, October 6, 1979, in Boston, MA; daughter of William Thomas (a builder) and Gertrude (Bulmer) Bishop. Education: Vassar College, A.B., 1934. Avocational Interests: Travel, sailing. Memberships: National Institute of Arts and Letters, Academy of American Poets (chancellor, beginning 1966). Houghton Mifflin Poetry Award, 1946, for North & South; two Guggenheim fellowships, one in 1947; American Academy of Arts and Letters grant, 1951; awarded the first Lucy Martin Donnelly Fell Partisan Review fellowship, 1956; Pulitzer Prize in poetry, 1956, for Poems: North & South [and] A Cold Spring; Amy Lowell traveling fellowship, 1957; National Book Award, 1965, for Questions of Travel; National Book Award, 1970 and Chapelbrook fellowship, The Complete Poems; Order Rio Branco (Brazil), 1971; LL.D., Rutgers University and Brown University, both 1972; Harriet Monroe Award for Poetry, 1974; National Book Critics Circle Award for Poetry, 1976, for Geography III; Neustadt International Prize for Literature; honorary degrees from numerous universities, including Brown University, Princeton University, Smith College, and Amherst College. Poet, author of prose, and translator. Library of Congress, Washington, DC, consultant in poetry, 1949-50, honorary consultant in American Letters, beginning in 1958; Harvard University, Cambridge, MA, instructor, beginning 1970. * North & South (also see below), Houghton Mifflin (Boston, MA), 1946, reprinted, 1964. * Poems: North & South [and] A Cold Spring, Houghton Mifflin (Boston, MA), 1955, abridged edition published as Poems, Chatto & Windus (London, England), 1956. * Questions of Travel, Farrar, Straus (New York, NY), 1965. * Selected Poems, Chatto & Windus (London, England), 1967. * The Ballad of the Burglar of Babylon, Farrar, Straus (New York, NY), 1968. * The Complete Poems, Farrar, Straus (New York, NY), 1969. * Geography III, Farrar, Straus (New York, NY), 1976. * The Complete Poems, 1927-1979, Farrar, Straus (New York, NY), 1983. * Edgar Allen Poe & the Juke-box, Farrar, Straus & Giroux (New York, NY), 2006. Contributor to anthologies, including Trial Balances, edited by Ann Winslow, Macmillan (New York, NY), 1935. * (Translator from the Portuguese) Alice Brant, The Diary of "Helena Morley," Farrar, Straus (New York, NY), 1957 , reprinted, 1995. * (With the editors of Life) Brazil, Time, Inc. (New York, NY), 1962. * (Editor, with Emanuel Brasil) An Anthology of Twentieth-Century Brazilian Poetry, Wesleyan University Press (Middletown, CT), 1972. * (Translator, with G. Aroul) Octavio Paz, Selected Poems of Octavio Paz, New Directions, 1984. * The Collected Prose, edited and introduced by Robert Giroux, Farrar, Straus (New York, NY), 1984. * (With Marianne Moore and Robert Lowell) Becoming a Poet: Elizabeth Bishop with Marianne Moore and Robert Lowell, Farrar, Straus (New York, NY), 1989. * One Art: Letters, Farrar, Straus (New York, NY), 1994. * (Translator) Joao C. De Melo Neto, Selected Poetry, 1937-1990, University Press of New England (Hanover, NH), 1995. * Exchanging Hats: Thirty-nine Paintings, edited by William Benton, Farrar, Straus (New York, NY), 1996. * (With George Monteiro) Conversations with Elizabeth Bishop (interviews), University Press of Mississippi (Jackson, MS), 1996. * (Editor, with Joel Conarroe and Theodore Roethke) Eight American Poets: An Anthology, Vintage Books, 1997. Also translator, with others, of Travelling in the Family by Carlos Drummond. Contributor of poetry and fiction to periodicals, including Kenyon Review, New Republic, Partisan Review, and Poetry. Co-founder of Con Spirito. Some of Bishop's poetry has been set to music in Three Ages of Woman: For High Voice and Piano, by Lee Hoiby, Southern Music, 1994, and Invitation to Music: For Mixed Chorus and Piano, by Libby Larsen, Oxford University Press, 1998. Bishop read from some of her works on the sound recording Elizabeth Bishop, Random House, 2000, and on The Voice of the Poet. 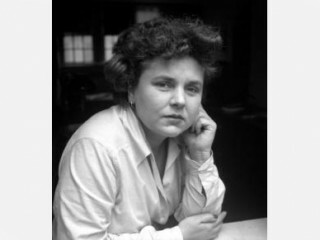 View the full website biography of Elizabeth Bishop.